As I had explained on the Soiled Sinema facebook, I received a tip that led me to a thrift shop up the road with a large handful of martial arts films. Among these rare Ocean Shores Video Limited tapes was Ruthless Revenge (1979). Boasting wild cover art of two extraordinarily goofy gentlemen trading blows with a bearded fellow, I decided that Ruthless Revenge would be the first of the many to set sights towards. 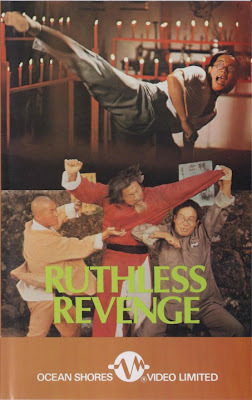 Also known as Invincible Kung Fu and The Two Tricky Kids, Ruthless Revenge passively employs physical farce much akin to The Three Stooges which lightens the action and makes for a truly enjoyable motion picture. In the opening, a drunken fool pickpockets a student of kung fu aboard a ferry. Transplanting his funds into the pocket of another martial artist, the drunken "wizard" knowingly orchestrates a burning rivalry between the two that persists even ashore. Once there, these two "masters" ("Bruce" Leung of Kung Fu Hustle fame and Kwok Choi Hon) compete in a ridiculous sparring match in which one trumps the other on a basis of turns. Bruce Leung's secret weapon is a weathered book detailing forms and styles of martial arts dependent on kicks and Kwok Choi Hon's previous master taught him the strengths of fist combat. This sets a handicap for each other to duel endlessly as they are equally skilled. Only when the two squabbling masters come together can they overcome a greater enemy. After this primary round of sparring meets its end, the two are offered their own "kwoon" - school of kung fu. With both buildings positioned adjacent to each other, a line is drawn in between, separating the buildings and the teachings. When a local criminal leader discovers that the two kung fu masters seek to move in onto his territory he sends groups of thugs to straighten them out. Bouncing between the territories marked before the buildings, the two masters slap and reduce their enemies into pulp, all the while deploring one another with obscene insults. It is this intense slapstick that makes the comedy so effective in Ruthless Revenge; not even just the incredible choreography which features the two men vying for a particular item in a juggling-like fashion but the general insults slung at each other. The two on-screen persona's that endlessly bicker create such a wild world for the kung fu shenanigans to take place within. After defeating the local lord, help is sent for and the two masters are made homeless by the lord's elder relative. Only the help of the drunken master responsible for their conflict of interests can aid them in defeating their new enemy. And so is the plot of Ruthless Revenge - quite a product of narcissistic escapism. Mindless fun is the only thing to be had here so anyone expecting the flair of other Oriental productions such as Shaolin & Wu Tang might want to explore other venues of complicit Chinese design. Ruthless Revenge even ends on such a ridiculous and compelling note as getting slapped on the wrist and sent home empty handed. I have mentioned before the seemingly cold remove of the Asiatics towards domesticated creatures. Not quite cattle nor slaughterhouse material; the Eastern continents have no problem grievously harming creatures on camera for, in this case, HK authenticity. A very similar case would be Men Behind the Sun or even Don't Play With Fire - both feature cruelty to felines, although, in Men Behind the Sun's case, we witness the death of the cat, whereas in Don't Play With Fire, a cat is simply tossed out of a high window. I bring this up because Ruthless Revenge unspools a similarly petrifying scene of unfortunate injury to a domestic cat. The scene suddenly came out of left field. Here I was, enjoying a kung fu farce that is obscenely simplistic when, all of a sudden, my American sensibilities were challenged when, to prove a point, a drunkard thrusts a cat in a cramped cage with an irritated goose and snake. Despite being tonally thrashed during the climax of said scene, Ruthless Revenge remains an oft-hilarious excursion in slapstick and creative combat. Even for being cast adrift chink tropes, Ruthless Revenge was quite endearing to me, even if it ended on such a sudden cue that you're left blinking in disbelief. Way to force morality upon enthusiasts and students of an ancient art.